An idea has taken root in the bookosphere that e-book sales have peaked as the people who want e-books buy e-books and the people who want print continue to buy print. This may be spurred along by a January article by Nicholas Carr arguing that the e-book bubble has burst. This is not remotely the case. E-book sales aren’t declining. E-book sales percentage growth is declining. These are two very, very different things. The 6.2% rise in book sales in 2012 were propelled to an increase by e-book sales, and in fact, e-book sales for children’s books more than doubled. 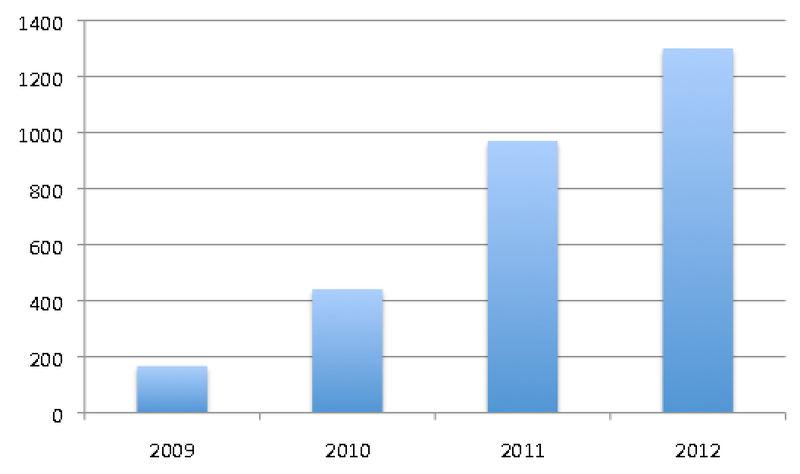 E-book sales were up 41% in 2012. This is less in percentage terms than the exponential 100%+ growth that was seen in previous years, but it still represents a significant rise in sales. What is misleading about fixating on percentage growth is that it’s looking at a market that started at zero five years ago. Seems like things are really slowing down right? Yes, 2011 was a huge increase. But growth in 2012 (41%) was still greater than in 2010, when it represented a 164% increase. UPDATE: As David Gaughran notes in the comments, the AAP’s stats don’t count self-published e-books, which could account for as many as 25% of all e-book sales. Great data. Thanks for breaking it down. That post is by Nicholas Carr. Not Paul Carr. Which is quite a big difference. And he discussed it further in his blog, where he backed away a little from the WSJ piece. And yeah, I think there was debunkage that has happened, but in conversation and seeing things online, I still feel like an idea has taken route that e-book adoption slowing down. I haven't seen anything to really indicate that's the case. It irritates me when traditional publishers or their spokespeople keep badgering ebooks or their sales. Better to recognize it and then design your strategy around it than be in perpetual denial! Thanks for this!! Definitely not declining, and I'm glad you cleared that up! Personally, I've heard too many false statements coming from the traditional publishing sphere that just brush off what I hear nowadays. You'd think that instead of being so stubbornly in denial, that they would put their energies into furthering their own ebook market & embrace the here & now, as well as the future. Oh, wow! I wonder if he was being manipulative with that information or whether he made poor assumptions himself? Either way, thanks for clearing it up. Unless you read right to left. But that's a slippery slope. I suspect that the situation is that the demand for books (e- or otherwise) is relatively constant. In that case, we should be considering the percentage of the book market that e-books are holding, and fit them to a logistic curve. A logistic curve is very close to exponential at the low end, but exponential growth cannot be sustained when there's a limiting value. We shouldn't be surprised that we initially saw exponential growth, but no longer do. You see the same thing when retailers report holiday season sales. They want sales to increase by a greater percentage than they increased the year before. So they could still make a profit and still have an increase in sales, yet if the % increase doesn't exceed the previous year's % increase, that gets reported as a "disappointing" season. In any discussion of data and statistics, always look at the raw numbers whenever possible. We have numbers here, but no source. Who reports these numbers? Is there an estimate of unreported sales in there? (Not all retail outlets report sales to anyone except the tax man). I'd also love to see numbers by vendor. Some have claimed that Amazon is "off" in sales, while Smashwords is gaining ground. Since the "reporter" was the owner of Smashwords, I'd love to see an independent report here from some reliable source (if any exists). It's all sourced, the links have all the data. It comes from the AAP. I don't think they're able to drill down by retailer. Real data can bring alot of clarity – terrific post, Nathan. @ Al – one thing that's not included is self-publishing (through Amazon) and Amazon imprints. Amazon does not release their data, so you know some numbers are missing. The growth in e-book sales only grew by double digit percentages in 2012 versus triple digit increases in previous years. Anyone that interprets that as the decline of e-books has something else on their mind. When you read other essays by Nicholas Carr about digital media, we find similar sentiments. Unfortunately, all the virtues of paper and ink books that he writes about are also true of clay tablets. I don't see why it would matter even if it were slowing. The market (demand) is finite, the supply is not. Eventually the growth will balance out, but that's not a bad thing for anyone. I don't know what I'd do without you! I'd dwell in the crazy world of Numonia :). ~Yes, I'm a fan with my kiddos. Hi Nathan, it's also important to note that the AAP figures don't take any account whatsoever of self-publishers – so they aren't even coming close to measuring the whole market. And, as self-publishers have grabbed a bigger and bigger share of that market in the last few years, that could explain quite a lot of the supposed drop off in growth numbers. By my estimates, self-publishers have grabbed around 25% of the US ebook market. Thanks David, and yeah, that's a very good point. I'll update the post tonight with the self-pub info. Good post. As Mark Twain said, "there are lies, damn lies, and statistics." Misrepresenting things is so easy.